To invite your collaboration in locating households, landowners, and features as they existed in the 1860s in Coosa, in western Floyd County, Georgia, for historical and genealogical purposes. My particular interest is in locating HARDINS among their neighbors, but information about other names and connections you observe is welcome, and I will post them. The more households we identify the better we understand that time and place. My assumption is that families who live very close to each other decade after decade are likely siblings or inlaws. Point me to land records, tax maps, tax lists, and newspaper articles. Because many Georgians sold to Carolinians, records of land transfers to second and subsequent owners would be useful. I have access to Ancestry.com. Anticipating the removal of the Cherokees, Georgia surveyed its northwest beginning in 1831, calling it Cherokee County. In the Sixth Cherokee Land Lottery of 1832 lots of 160 acres were given by lottery to Georgians who had lived in the state for 3 years. Revolutionary War veterans and orphans whose fathers were killed in the Revolutionary War, War of 1812, or Indian War drew two lots. Land could be sold and many tracts were bought by Carolinians, explaining why the Coosa area census district was called the "North Carolina District." A law passed on December 3, 1832, divided original Cherokee County into ten counties, with Floyd County being one of them. Rome fell in the Third Section, division 23. Coosa fell in the Fourth Section, divisions 4 and 15. Of the Fourth Section, divisions 1, 2, 3, 16, and 17 were 40-acre lots. Division 3 and 16 (with 40-A. lots) are just south of Coosa, and stretch from Van's Valley through Cave Spring west to the Alabama line. All the lot numbers are shown on the 1871 and 1895 maps here, where each large square is 1/2 mile on a side. 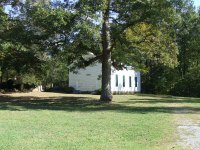 By 1860, the residents were well-settled in Coosa, complete with a Masonic lodge, churches, and a network of neighbors. Our focus is on Coosa and The Narrows, or Cathey's Gap, two miles west of Coosa. Sardis Presbyterian Church was at the north end of the gap. The Cathey home, where Miss Nanny Cathey kept an irregular diary during the Civil War, was possibly at the south end of the gap. Joseph Hardin lived to the west. On the coldest winter days he would stop and warm at the Cathey's on his way to Pisgah Baptist Church at Coosa, where many Hardins are buried. 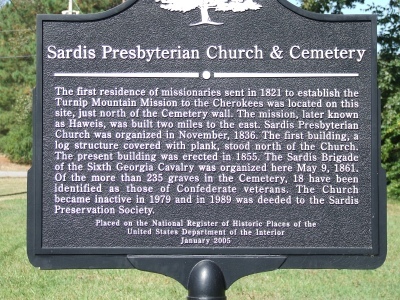 A historic marker outside Sardis Presbyterian Church reads, "The first residence of missionaries sent in 1821 to establish the Turnip Mountain Mission to the Cherokees, was located on this site, just north of the cemetery wall. The mission, later known as Haweis, was built two miles to the east. 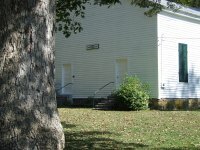 Sardis Presbyterian Church was organized in November 1836. The first building, a log structure covered with planks, stood north of the church. The present building was erected in 1855. The Sardis Brigate of the 6th Ga. Cavalry was organized here May 9, 1861. Of the more than 235 graves in the cemetery, 18 have been identified as those of Confederate veterans. 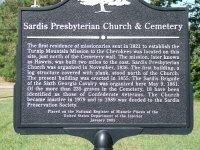 The church became inactive in 1979 and in 1989 was deeded to the Sardis Preservation Society. Placed on the National Register of Historic Places of the United States Department of the Interior January 2005." Click on one of the 4 map quadrants below to go to that quadrant. The floating menu that appears can be repositioned with arrows. Click on dates to see maps from those dates. All the maps will load and remain on your computer for rapid switching among them. Look for names to be plotted on the 1895 map. RED font will show residence in the 1860s and 1870s. BLUE font will indicate 1880-1895. PURPLE means probable continuous residence 1860s to 1895. The maps are overlaid, with a 1966 topographic map being the base reference. The older maps are inaccurate and don't overlay well, but a correspondence can be made out. "Map of Floyd County Made by Authority of the State." William Phillips, Civil Engineer (1871)Similar to above, blank. Floyd County 1895 with some household names, churches, schools, railroads, and roads. The darker lines are railroads. Hardins in Pisgah Baptist Church Cemetery, Coosa"
The diary begins in 1861 and ends in 1865. A good many local names are mentioned. The entire diary is presented here in PDF in four files. The PDF is indexed and searchable, but the text-recognition is sub-standard and the term sought may be garbled. The recognition is too poor to save the PDF as text. I see no copyright message. The transcriber of the diary and the writer of the preface is a Cathey descendant and a woman. She is so far anonymous. Please contact me with her name and I'll attribute her. Parenthetical comments in the diary are the transcriber's.